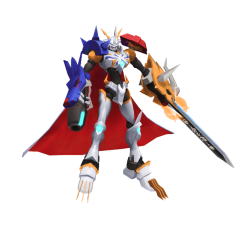 Omegamon X is an enhanced version of Omegamon and a carrier of the X-Antibody Factor : Omegamon – Alpha and X-Antibody Factor : Omegamon – Beta. 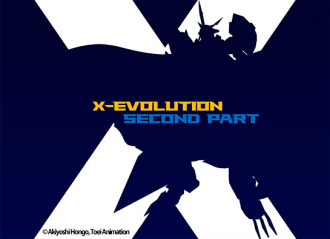 After Alphamon Ouryuken's sacrifice against Dexmon, Omegamon gains Alphamon Ouryuken's X-Antibody, becomes Omegamon X, and sees Yggdrasill's actions for what they are. Omegamon X destroys Yggdrasill with All Delete, resetting the Digital World. 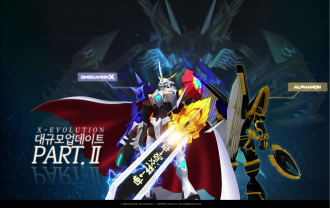 Omegamon X was added to Korean Digimon Masters on November 15, 2018. Omegamon X was added as a Mercenary Digimon to gDMO with the December 12, 2018. Garuru Cannon, Light attribute 6 seconds cooldown 870 DS consumed 2 skill points per upgrade Learned at Lv. Grey Sword, Light attribute 9 seconds cooldown 1304 DS consumed 3 skill points per upgrade Learned at Lv. All Delete Light attribute 600 seconds cooldown 3548 DS consumed 3 skill points per upgrade Learned at Lv. The third skill is an area of effect hitting every enemy around Omegamon X with maximum range.